“Jesus left the temple and was walking away when his disciples came up to him to call his attention to its buildings. ‘Do you see all these things?’ he asked. ‘I tell you the truth, not one stone here will be left on another; every one will be thrown down’” (Matthew 24:1‑2). We eat protein bars. I fix my tasty International Coffee in our room for breakfast. We want to leave before the dining room opens. As hot as it has been during the day, an early day at the archaeological park works best. I dig my dirty clothes out of our makeshift hamper. The clothes I wore on the rampart walk will do nicely. They already stink! We begin thinking like the locals in some ways. We’ve discovered getting around goes faster if you walk outside and around the city walls. We exit Jaffa Gate and turn toward the route I walked back in 1998 to Jerusalem University College on Mount Zion. Walking down the hills, memory kicks in for my knees. They begin to hurt. I start feeling sort of, well, not good. We cross the tricky intersection and start up the hill toward David’s Tomb. Oh, yeah, here it comes – diarrhea. The bathroom inside the building at David’s Tomb remains locked at this early hour. We already walked down to the school and back up to the vacant lot where ten years ago our professor, Wink Thompson, lectured us about the sandstorm in which we stood.David and I come in the back way by Dormitian Abbey, but too early for open bathrooms. We continue around the city walls to Zion Gate. We get to Zion Gate and the usually not so clean public rest rooms. Yea! This time they have paper. My condition comes on as a result of the heat. Sometimes my body reacts this way. I admit, and David will agree, I’ve been cranky since our start this morning. I keep praying for God to change my attitude. I feel angry. I keep kvetching like an Israeli in the wilderness, all the time asking for forgiveness, knowing what a gift it is to even be here. Yet, I continue focusing on my suffering until reaching theTemple Mount. Soon after arriving at the archaeological park, God grants me rest from myself. Once again, I concentrate on His work and His plan that centers on Yeshua and Jerusalem. 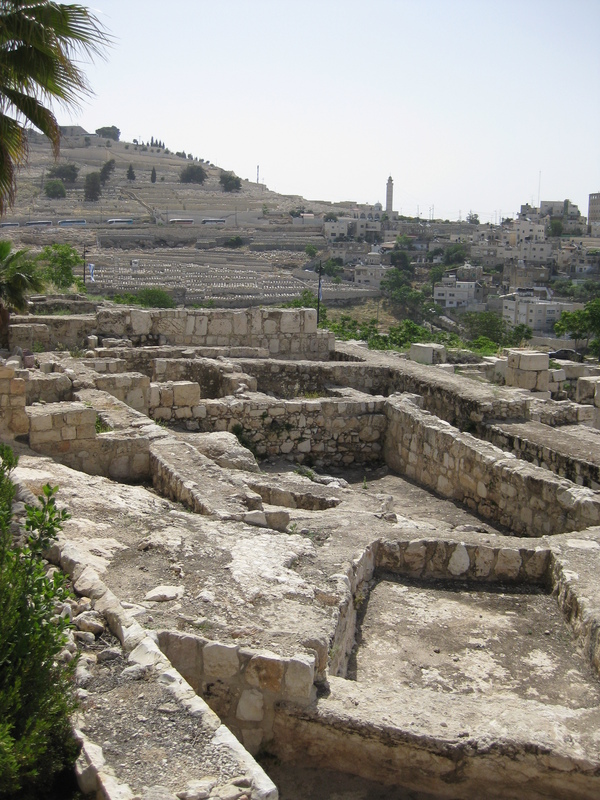 The Jerusalem Archaeological Park reveals amazing discoveries about Jerusalem during the Second Temple period. Resting on the original steps Jesus walked to enter the Temple Mountat the Hulda Gates overwhelms. 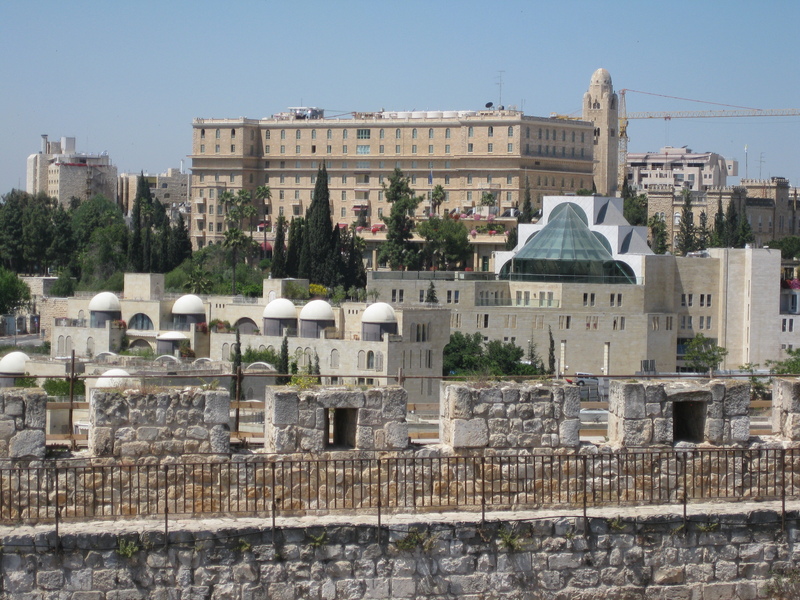 We admire the southern wall of theTemple Mount in the area known as the Ophel. These bleached stones reflect the summer heat.David snaps a few pictures. I make my way back to the shade-providing awning. Sitting here, I notice men working on top of the Al-Aksa mosque. They swelter in this heat, and I sympathize with them. In the meantime,David falls in love again. All the things he read about or saw on the net live here; the trumpeting stone, the Temple mikvah, the huge broken stones of the temple tossed off the Temple Mount by the Roman soldiers in 70AD, the Herodian street with the shop doorways on the side, and so much more. David returns from his short tour on the west side of theTemple Mount excited. He witnessed a group of junior high school aged youths on a field trip. They sing loud and clear, “Ki MiZion, tetsay Torah….”(The law will go out from Zion). He recognizes it because we sing it every Shabbat before reading from the Torah. We consider this special moment a divine appointment. David feels another connection to Jews living i nIsrael today. Their love of Torah reminds him of the depth and riches of Christ he missed before reading the Old Testament. Archaeological findings reveal a history fueling my imagination. Perfectly honed Herodian streets with distinctly carved stones tell the story of wealth and riches. Stones on the ground that fell during the destruction of the Temple- the smallest of which weighed two and one half tons – report the devastation of war! An unearthed Byzantine home unwraps mysteries about everyday life centuries ago. The mikvah declares the past presence of priests and devout men. Across from my shaded awning I see the remains of the Umayyad Palacefrom the early Islamic period and a huge impressive tower built by Fatimad Sultan, renovated by the Crusaders, the Ayyubids, and the Mamluks. Even today, God draws people from all nations to this small spot. The heat of the day beats down on us. Out on the plaza soldiers, in groups of thirty or more, walk by. Some groups carry large automatic rifles, others show none. These young men and women always catch my attention. They hold the task of protecting this incredible country. While sitting under the awning, I see a hundred or more of them pass toward the southern wall of the Temple Mount. Across the way, but still under the awning, three women and a man sit sharing a stone bench. Another man (obviously a guide) talks about the significance of this place. The group looks absolutely exhausted. The man in the bright orange shirt looks like he may fall off his perch any minute. One woman just looks bored. The other two women question the guide repeatedly, prolonging the agony of the man in the orange shirt. Poor fellow. Davidand I drench our thirst, then our faces, necks, arms and clothes in the drinking fountain and hike over to the Davidson Center. The Davidson Cente rranks high on my list of favorite or most dramatic surprises. The center explains the archaeological findings just outside using a range of exhibits. The Story of the Pilgrim, a movie at the center, inspires me. It includes a virtual view of what Solomon’sTemple probably looked like. We walk into the little theater while the Hebrew movie with no subtitles is still running. We sit through the Hebrew version for fun. We want to see how much Hebrew we can understand. Can we pick up the story line? Some words we recognize and figure we know what goes on most of the time. I begin feeling a little smug about getting the language. Then the English version starts. Well, we got some of it. Most of it we totally miss, including the main plot. I love The Story of the Pilgrim about a man who comes from far away to worship at theTemple. It cost him a year’s wages and several weeks to make the journey. When he sees the splendor of the Temple and goes to make his sacrifice, he is humbled. This virtual reality model captures the grandeur of the Temple much better than scale models. The Temple looms majestically, although not as majestic as the One it honors. I am humbled by His very presence within me. Outside again, loud music, singing, and chanting come from the upper plaza near the security gates. A band plays. I hear familiar Hebrew songs flowing from the plaza. Loud drums beat and children sing. As they get off yellow school buses, the music stops. Shofars sound. Then we hear more shouting and music. Excitement fills the air! Most of the three hours we spend at the Jerusalem ArchaeologicalPark includes hearing this assemblage. We finally get up to the plaza and encounter a Bar-Mitzvah parade! They celebrate bar-mitzvah for boys (bat-mitzvah for girls) on Mondays, Thursdays, and Saturdays. When a Jewish boy reaches the age of 13 (12 for girls), friends and family join in the special birthday celebration. That’s when they reach the age of religious duty and responsibility. It encompasses more, but you have the basic idea. SinceDavidheardChristChurchserves a good lunch, we hike up the hill for a nice spot on the patio. A quiet refreshing place with shade branches overhead welcomes us. The pastor who preached Sunday’s sermon sits near us. He did a great teaching on how God cannot be coerced or manipulated. Unfortunately, we often find ourselves doing just that more often than we like to admit. A tour group comes by. I recognize one of the ladies as the song leader last Sunday morning. Last Sunday, the pastor introduced a young couple with a newborn to the congregation. They intern here for a year before moving on. Relaxing on the patio brings all this and more flooding back to my mind. After lunch I make an executive decision. On this hot day I will do best spending the rest of the day at the Gloria. My knees still hurt from our fun day on the ramparts. David, eager to see more of theOldCity, goes exploring. Thankfully, I get busy reading and writing. Out of curiosity, I switch on TV. Yes, we have TV in our room. We’ve been here two weeks and never had it on. I can’t get it to work and call the office. They send a man who shows me what button to push. How embarrassing. He leaves. I push the magic button. Headlines fill the screen, “Netanyahu meets with President Obama” from the BBC! I turn it off. Davidreturns to the Jewish Quarter and gets the Scripture for inside our mezuzah from the Scribe, Yosef. He also buys a beautiful painting. Beautiful, but expensive, so he makes it his special souvenir of our trip. He visits two museums. Although quite old, Rabbi Wiengarten, the spiritual head of the Jews, got unjustly hauled off as an exile to Jordanin 1948. After the reunification in 1967, his daughters and others created the Old Yishuv Court Museum as a visual testimony to the fact that Jews lived in the Quarter before 1948. It displays Jewish rooms during various periods before 1948. Alone on the Ramparts museum shows pictures and film of the battles for independence in 1948. The sad movie causes David to wander the Cardo area aimlessly for awhile lost in his thoughts. David comes back to the Gloria totally wiped out. To cheer him, I remind him of Israel’s national athem, HaTikva (The Hope). “In the Jewish heart a Jewish spirit still sings and the eyes look east toward Zion. Our hope is not lost, our hope of two thousand years to be a free nation in our land, in the land ofZion and Jerusalem.” We googled HaTikva and listened to a beautiful version by Barbara Streisand voicing the resiliency of the Jewish people and the faithfulness of their God. I fix him a chocolate shake with peanut butter. Fixing a shake is a lot different here than back home. I start with lukewarm tap water (disguised under the cold-water faucet), add chocolate protein shake mix, and powdered peanut butter. Then I use David’s battery powered whisk. What I don’t end up wearing, he gets to drink! In the Old City of Jerusalem, you never get ice for a drink. They just hand you the bottle or can of soda. If you ask for a glass with ice, they reply, “It’s cold.” However,David gets ice from the hotel bar almost every night for his knee. I feel positively naughty by using some of the ice in a Pepsi Max. Oh, but it’s such a treat! Bread stands and all kinds of food sellers abound in the Old City. Bread arrives daily along with food served in all the restaurants. Tourists purchase bottled water and souvenirs that must be restocked. Shockingly, loading docks do not exist here. Yesterday I saw a flat bed truck delivering a full load of bottled water to the Western Wall, probably a standard daily delivery. Everything here costs because of the expense of getting things in and out. Trucks can navigate only a few streets, so pushcarts must do the work. A small tractor pulls the hand loaded trash cart along the steep streets. The amount of inventory these little shops hold amazes me. Each little hole in the wall holds tons of products. Stuff stacked from floor to ceiling – necklaces, bracelets, earrings, bric-a-brac (whatever that is), rocks, wood carvings, silver, coins, and more overflow into the street. Things that don’t sell just stay. They never go away. Once they become antiques someone will buy them. “…and in the morning you will see the glory of the Lord, because he has heard your grumbling…”(Exodus 16:7). The airport shuttle drops us off at approximately 7:30 a.m. on May 6, 2009. The Delta agent checks our bags all the way to Tel Aviv. We won’t have to deal with the four bags (totaling 200 pounds) at JFK in New York. Our carry-on luggage includes David’s backpack and my forty-pound purse with computer. The flight to New York is pleasant. How could it not be? Delta provides us with personal TVs and snacks. The Lord furnishes good weather. I momentarily imagine how difficult travel used to be, centuries ago. Discarding that depressing thought, I push back in the soft leather seat, sigh deeply, and close my eyes. We arrive at JFK thirty minutes early due to a 65-mph tail wind. The early arrival does us no good, though. The outgoing plane blocks our arrival gate, so we end up sitting on the tarmac waiting for our scheduled arrival! Anxiety sets in and I begin to get a little claustrophobic. Sometimes, not often, I get claustrophobic. Recently, I was stuck in an elevator by myself for forty minutes and I don’t think I quite recovered. Thank Heaven this time I’m not alone. David sits next to me and encourages me to grip his hand. As you read the following pages, it will become obvious David is my hero. He’s my good and perfect gift from God. Our love deepens and becomes more precious each year. Except when he works, we spend all our time together. A whole month with no work will be glorious. David has been reading about Jerusalem for over a year now. He studied Biblical Hebrew before that, but it didn’t stick. The past couple of months he revisited the Pemsleur (Quick and Simple) Modern Hebrew lessons 1-8 and then 9-20. These are by far the best conversational Hebrew lessons I have ever heard. Repetition teaches. Much repetition makes it fun to play games with the narrator. After listening several times, I start trying to say the phrases, before the narrator gets to them. I have fun with them. David is still working on lessons 20-30. We both listen to each lesson two or three times. It still doesn’t always stick. In spite of that, the audio lessons help and our ear for Hebrew improves. Once in the terminal, our four-hour layover at JFK flies by. David and I go directly to our gate and explore the area nearby. We read, people-watch (one of my favorite activities), and contemplate the eleven-hour flight to come. As the waiting area gradually fills with men in black suits, black top coats, black hats and curly long sideburns (called payos ), we realize many Orthodox Jews will be on our flight. It’s fun to hear Hebrew in the JFK waiting room. Neither of us understands conversations, but occasionally words sound familiar. “Yes,” she replies. The announcement blares over the PA system. Our group will be sub-ject to the additional screening. We visit while waiting. She is from Israel and has been visiting the United States for the past six months, mostly on the coasts. She mentions a news story reported Israeli security has gone lax. Israeli security dropped from the most reliable airport security to #4! David and I are shocked! Israeli security has always been the gold standard in world security. Now, America is zealous about security, too. As the herd of passengers obediently files past guards to a room off to the side, I can’t help but notice the number of Orthodox Jews boarding. There are a lot on this flight. It occurs to me that over the centuries, Jews have been subject to special rules, rules much more demanding with much worse consequences than going through security checks a second time. Flashes of Hitler’s death camps invade my mind. The aircraft is full. We hunker down for the long flight. I’m disappointed because this older plane lacks personal TV screens. As close as the TV screens are, we are subject to the airline’s movie choices. Some we’ve already seen; some we don’t want to see. We listen to our iPods and language lessons. David listens to lessons 20-30. I’m on lesson 8. For some reason, I seem to pick up Hebrew faster. That’s a joke. I had conversational Hebrew classes a couple of years ago. I didn’t think I learned much then, but words come back to me now and then. I love the language. Soon we will be in Jerusalem! They feed us after a couple of hours. To get into the spirit of this trip, we pre-ordered kosher meals. All the negative comments about airline food must be pure propaganda. These meals are delicious! One trip through the cabin after dinner and the crew disappears for the next eight hours. We sit next to business class and hear flight attendants busily pampering them. We smell their coffee all night long. Those of us in coach deal with things like hunger, thirst, and trying to get around people blocking the aisles. Whenever possible, Orthodox Jews pray standing rather than sitting. “I stand in awe of your deeds, O Lord” (Habakkuk 3:2). Their large black hats and long black coats with the beards and sideburn curls signify the traditional garb of a nineteenth century Jew. Many Jews in Israel today came from European countries. Sometimes, the dress suggests the country their country of origin. There are specific differences in the types of black garb worn for each Jewish sect . The Orthodox Jewish men who dress like this set themselves apart from the conventional Jewish and the Gentile population. Where are the flight attendants? Bathrooms are out of toilet paper. Disgusting! The crew evaporated. I want attention. I want snacks. I want to watch something else on TV. I want something to drink. I want to put my feet up. I just want to be there. Me, me, me. Sometimes I get so sick of my own kvetching . The Captain repeatedly asks the aisles to be cleared. He warns of turbulence often and instructs everyone to sit down and fasten their seat belts. Little turbulence actually occurs. The Orthodox Jews ignore him. Jews understand prayer is important. The “standing prayer (Amidah) ,” which they say three times a day, must be prayed while standing. Just before 9:00 a.m. Jerusalem time, the Orthodox Jews don tallit and phylacteries before beginning their morning prayers in earnest. There have been prayers throughout the flight, but when tallit and phylacteries come out, it inspires. God invites us to stop complaining and join the others praising Him. What an excellent idea. At any moment, in any situation, it is best to stop complaining and praise God. As Job reminds us, after he lost all his riches and his children, “Naked I came from my mother’s womb, and naked I will depart. The Lord gave and the Lord has taken away. May the name of the Lord be praised”( Job 1:21). The closer we get, the more we wake up, not that I ever actually slept. Anticipation invigorates us. Ninety minutes from Tel Aviv, the captain announces we are entering Israeli air space. He broadcasts that, according to Israeli law, everyone should be in his/her seat with seat belts fastened. In a much better mood now, David and I laugh. Think about it. Traveling at 600 mph, with a 90 mph tail wind, it will take us less than a minute to fly over Israel itself. Israel is 263 miles by 10 miles, about the size of New Jersey. It truly is funny! Israeli air space, indeed. “Hi, Happy Easter! How was the trip?” David’s mother greeted us as we carried our bags to the house. “Come in and meet SuLing. She’s living here and helping out while attending the university.” She gestured toward a lovely Chinese girl appearing to be in her early twenties. SuLing came to theUnited Statesa short time before my husband, David, and I visited his family for Easter holidays. The morning after our arrival, SuLing accompanied us to church, a normal Sunday activity for three of us. However we didn’t consider that church would be a new experience for SuLing. My heart jumped to my throat as a dozen explanations collided in my brain. Easter? Easter. Christ died so we could be freed from sin. He lived a perfect life so He could be shamed and beaten and crucified for us, for us, sinners who were unworthy to communicate with God. He died for me, SuLing, and He died for you! And He rose again on the third day just like He said He would. He never broke a promise. He never hurt anyone. He healed the sick, made the blind see, and made the lame walk. He’s our Salvation. He’s our Intercessor. He’s our Everything. Let me tell you how to have Christ. Oh! I just need to tell you about my Lord so you can have Him, too. I went limp. But she doesn’t know what that means! Forgive me, Lord, for not being ready to share my faith. God, in His loving wisdom and in His own time, was preparing us. “I feel like I didn’t answer SuLing’s real question very well,” David confided in me later. We chuckled at my attempt at humor, but all week the Holy Spirit nudged us to find a way to tell her about Jesus Christ. The week passed quickly. Suddenly it was time to leave. Bless David, he always comes through. I took the Bible up to her room and prayed for the right words to encourage her to use it. “SuLing,” I wrote, “Please accept this Bible as a token of our friendship. When you have time, read John, Chapter Three. I left the note laying on top of the Bible on her desk. Then I considered that the Lord had set this in motion. What a wonderful coincidence we just happened to bring a Living Bible with us, I mused. Thank you, Lord. In August we planned to visit David’s mother again, and this time we promised ourselves we’d be prepared to witness to SuLing. We learned how to witness through booklets from Radio Bible Class on how to share your faith. We marked passages in our Bibles. We prayed for guidance and wisdom. In no time it August arrived. We felt good about our preparation. Driving up to the house, we discussed our plan. “Which one of us should actually witness to SuLing?” I asked as we strategized. As the week passed, I wondered, How can I going to approach the subject? It seemed that SuLing and I were either not in the right place at the right time, or the time didn’t seem right or something. Maybe I’m not ready, after all. Suddenly, the week ended and I hadn’t witnessed to SuLing. She and David’s mother waited by the car as we loaded our bags. Deja vu, I thought, just like last time we left. Only this time, SuLing is here. I just can’t leave without talking to her about Jesus. Frantically, in a voice louder than normal, I blurted, “SuLing could you talk with me for a few minutes before we leave?” My voice softened, “I want to tell you something about the Bible.” There, I said it. “If it’s all right,” I answered weakly. What a wimp I am, I thought. This shouldn’t be hard. I heard the door to the next room quietly close and I visualized David on his knees, praying. I took a deep breath. “Right now I’d like to talk to you about something else. Let’s turn to Romans 3:23.” As we went through a few scriptures one by one, I could tell by questions asked that she had been thinking about God for some time. We got down to the final question and I prayed in the Spirit as I spoke to SuLing, asking the Holy Spirit to convince her about Jesus. A comforting peace calmed me as I remembered David praying in the next room. Out in the hall, David met us. Four months passed since SuLing asked the question: “This Easter–what is it?” Today she met the resurrected Christ. Happy Easter, SuLing.